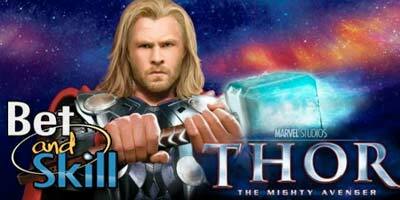 The Mighty Thor of Nordic mythology and the Marvel Universe are presented in this majestic 5 reel and 9 line video slot.The game has 3 progressive jackpots shared with all other Marvel super heroes’ video slots and a free spins feature.Play this game for free with £5 no deposit bonus offered by 888games! • There 3 Jackpots to be won – the higher your bet the higher your winning chances! • Marvel jackpots are awarded randomly – no matching symbols required. • The Thor symbol substitute for all except for Hammer Scatter. • 3 or more Hammer Scatter symbols trigger the Free Games feature – up to 10 free games. • All prizes during free games are tripled. · Winning combinations pay from left to right except for Hammer Scatter, which pays any. · Scatter wins are multiplied by total bet and added to payline wins. "Thor - How to play - Demo - 5 pound free - No deposit bonus"